A girl meets a guy at a bar, and the girl instantly falls in love - a classic love story. It was the same for Julian except for the fact that it took longer for him to get to know his girlfriend and fall in love! The American is a famous YouTuber who posts different kinds of content on his self-titled channel including vlogs, timelapse videos, short films, music videos, and more. 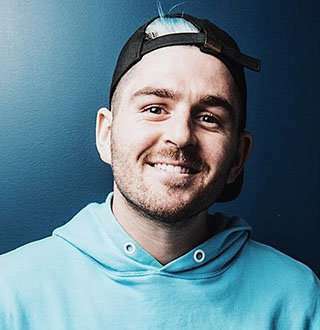 He boasts over 1.5 million subscribers in his channel Julien Solomita. Aside from videography, the Youtuber, aged 26 is also a musician and is known for nightmare songs. Julian as every other millennial joined Youtube at the turn of the first decade of the millennium. After joining Youtube on 8 December 2012 at the tender age of 20, he has seen a steady rise in his popularity an has a cumulative view of more than 300 million in his channel. His single most viewed video shows him celebrating his dog's 9th birthday. 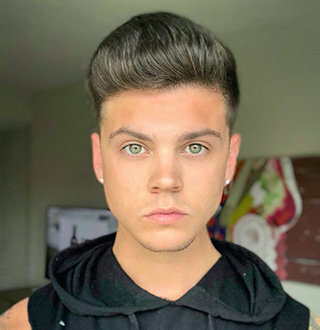 Apart from vlogging, he is also an aspiring singer and debuted his first single, The Creepy Song, and then went on to record a 17-track album named Nightmare Fuel on iTunes on 9 December 2014. He is also a part of a music band, The Shadows, along with two fellow YouTubers, Joshua David Evans and Arnold Telagaarta. The band released a music video titled Vlog With Me on 22 April 2015. A year later, he uploaded a parody video titled Pokemon Uber Go! - A parody of an Uber ad with a catchy slogan, "Uber GO! Catch a ride to catch em all". Around the same time, he also made an appearance as himself in an episode of the television talk-show Mostly Sports. Amongst his other accomplishments, he was nominated for "Vlogger of the Year" in the 9th Annual Shorty Awards. Born on 17 April 1992, in California, Julien’s parents separated when he was in the first grade. Later, his mother started dating his baseball coach Ted. They got married, and Ted and his three kids from his previous marriage became a part of his family. They would frequently go on vacations together. Tattoo Lovers: Danny Koker Enormous Net Worth Revealed! Richest Among Fellow American Pickers? He has two siblings, an older sister named Roxanne and a younger brother named Marlon from his biological father. Julien shares a close bond with his brother. He made sure to attend his brother's graduation ceremony in May 2017. Not just that, as a child he loved to play baseball with his brother. He was also part of his school’s baseball team and went on to become the captain in his senior year. With the aspirations of becoming a professional baseball player, Julien attended Chapman University, but his injuries in his freshman year forced him to quit, and could not play baseball again. He did, however, graduate from college with a degree in news and TV journalism. Apart from his love for baseball, he is a huge tattoo fanatic. His tattoos range from a cloud in the arm to a dart in his wrist. In June 2017 he shared a photo with his friend Shan Dude on his Instagram where he and Shan had their body filled with removable tattoos and captioned it as his punk version. Julien and his Youtube star girlfriend, Jenna Marbles aged 31, announced that they bought a house together on 16 May 2018. Since then, they’ve been living together in their lavish home with their three dogs, Peach, Kermit, and Marbles. Although the pair isn’t engaged, they’ve set themselves as a couple to beat with their timely updates, their chemistry and their love openly shared with their fans on their social media accounts. Julien first met Jenna at a bar where he worked as a bartender. They ran into each other several times until they eventually became friends. For a while, he also traveled with her to different places with intentions to keep her safe. After that, they got to know each other until eventually the pair finally started dating in 2013.